2016 Stratos 294 XL Evolution In the 294XL, theyll never see you coming. Performance engineered pure-composite Stinson hull, rated to 200 hp. Armed with every imaginable competitive advantage. Designed for maximum deck storage and floor space, organized for action. Single or dual console. High-performance digital cockpit. Hydraulic steering. Humminbird® electronics. 34-gallon divided aerated livewell. Bow panel with switches. Minn Kota® troller with recessed pedal. LED interior lighting. On-board charger. All resting on a deluxe, custom fit trailer..
2007 Stratos 294 XL AVAILABLE SOON! 2007 Stratos 294XL Trailer Included! 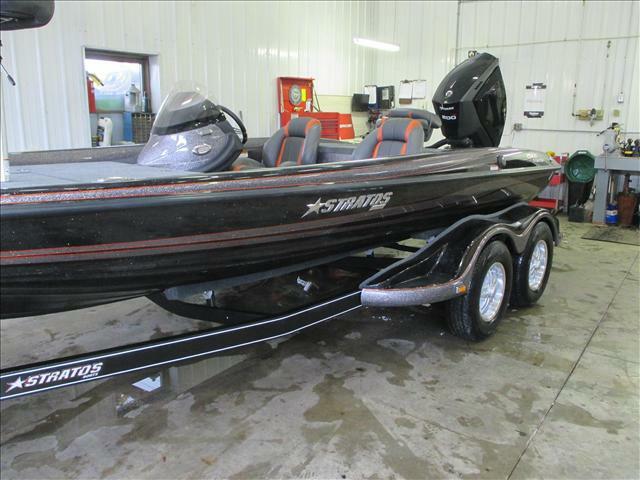 2007 Stratos 294 XL Pre-owned 2007 Stratos 294XL w/ Evinrude E200DHL HO E-Tec - Blue Color INCLUDED OPTIONS & UPGRADES: Boat Cover, Minnkota Maxx 70, Lowrance X52 In-Dash Console, Single Steer-n-Trim, Hot Foot. 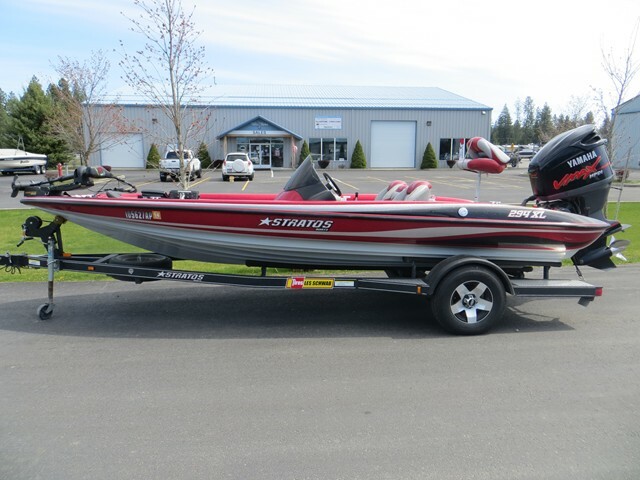 This Stratos 294 XL is an elite, tournament level fishing platform packed with standard features and a price to leave the competition in its wake. At 19'6" long and rated for a maximum 200 horses, the 294 XL gets across big water extremely quick, comfortable fashion and gives serious anglers more time to focus on fish. 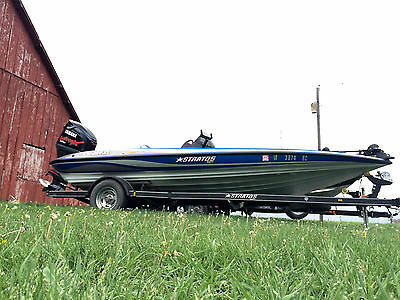 Performance engineered and NMMA certified, the 294 XL comes equipped with a long list of standard features including smooth, hydraulic steering, a Minn Kota trolling motor, and Lowrance electronics. A 91" beam provides plenty of room to maneuver fish, while a 34 gallon divided livewell keeps them happy and healthy until weigh-in. With a huge front deck, recessed trolling motor pedal and an on-board battery charger, the Stratos 294 XL is delivering tournament level performance at an incredible price. 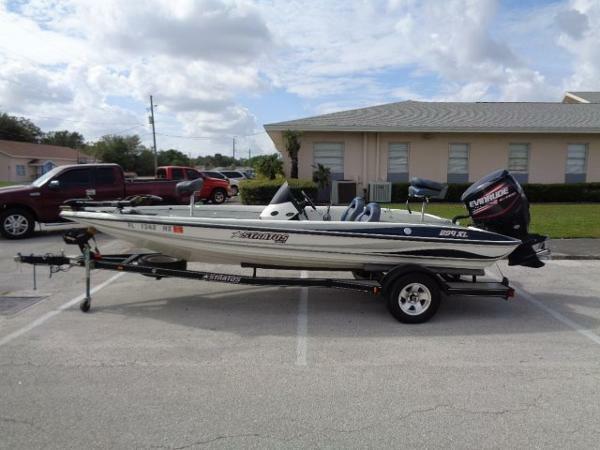 2017 Stratos 294 XL Evolution Here is a 2017 Stratos 294 XL Evolution. This rig measures in at 19 feet 6 inches, has a 34 gallon aerated livewell, 33 gallon gas tank and loads of storage. 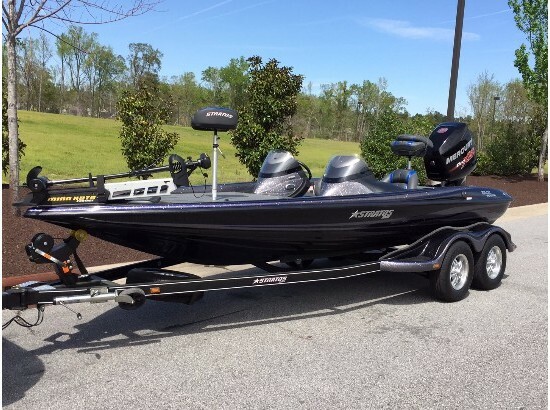 This units comes ready to fish with a Minn Kota 70 lb Maxxum trolling motor, Lowrance Hook 5 fish finder flush mounted at the console, hot foot throttle, custom towable boat cover, aluminum wheels and disc brakes on the trailer. This motor is powered by a Mercury 200 hp Pro XS Optimax outboard which will put you up right at 70 mph! Please call us at (937)-382-8701 with any questions you may have. 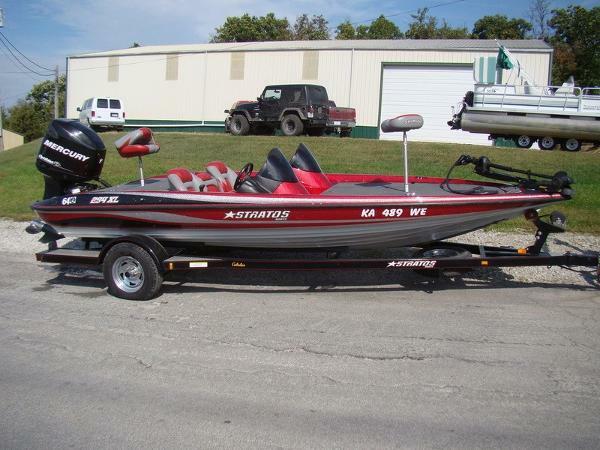 2011 Stratos 294XL Evolution, 2011 Stratos 294XL Evolution - PSS04211L0112011 Evinrude 200 HO ETEC - 052623282011 Stratos Bunk Trailer - 534SB2111B2084142Being the 201XL's 'little brother' doesn't mean being short on features and bigger boat performance. 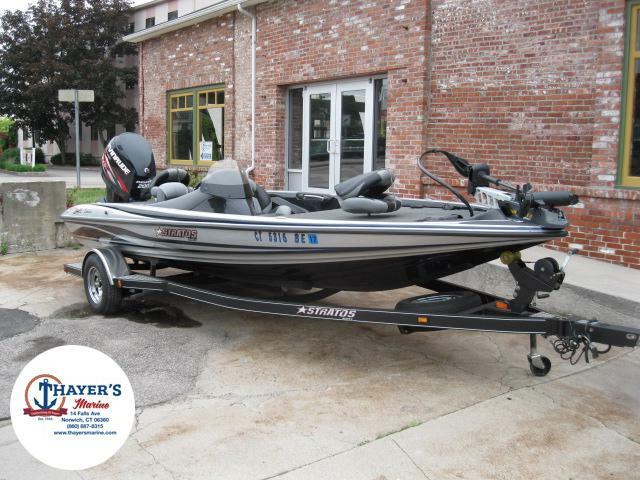 The most affordable 19-footer on the water.- Included Options -- Swing Tongue- Spare Tire- Hot Foot Pedal- Port Ladder- Boat Buckle Tie-Downs- 2 Cup Holders- Black Painted Trailer with Stainless FendersThree generations of boating know-how make Thayer's Marine, Inc. your leader for everything boating. With over 100 years of boating experience, we have learned what works, what doesn't, and pioneered what will. Our sales department works to find you the boat of your dreams, our parts department helps get you back on the water, and our service department fixes those problems you cannot, the first time. Oh, and CSI scores in the upper 95 percentile to back it all up. 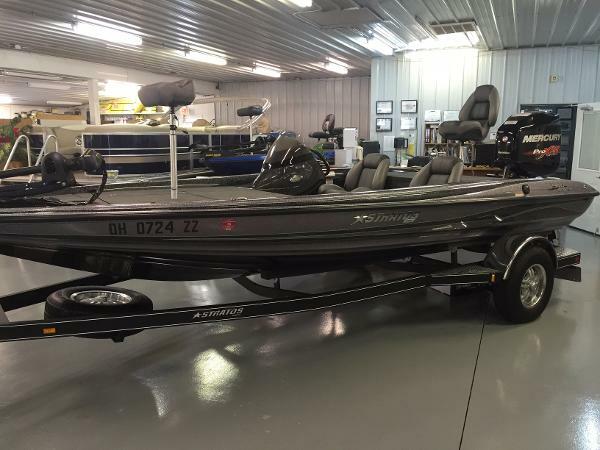 2015 Stratos Bass Boat 294 XL Evolution, Price Reduced!!! 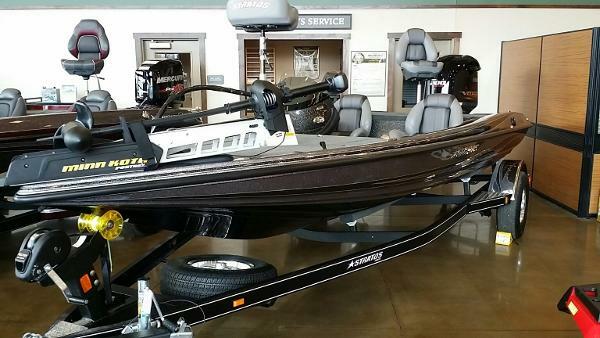 Here is a 2015 Stratos 294 XL Evolution Bass Boat. This unit is upgraded with series tournament fishing in mind. 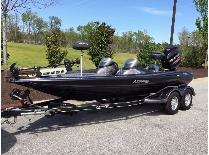 It has a 294 Team package upgrade, (gives you all the standard upgrades of the 201), 6" manuel jack plate, 7' keel guard, boat buckle tie downs, G2 hot foot, Lowrance HDS 9 touch at the console and HDS 7 touch on the bow, Lowrance structure scan at the console, Minn Kota Fortrex 80# trolling motor with US 2, MK 345 Precision battery charger, trim level, troll tamer and tandem axle trailer. This rig is powered by the new Evinrude 200HP HO G2 outboard. Please call us at (937)-382-8701 with any questions. 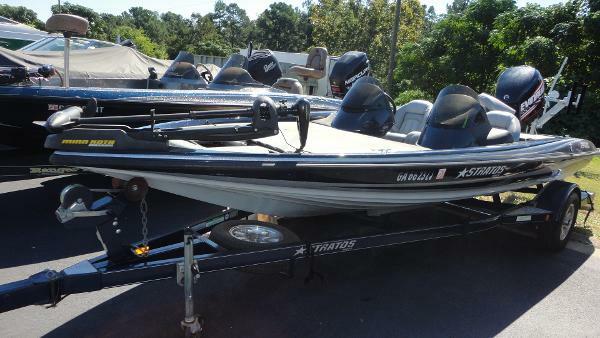 2008 Stratos 294 XL,2008 Stratos 294 XL, Yamaha V Max 200, 80 LB Minnkota, 3 Hummingbird depth finders, GPS, Stratos trailer with brakes, newer tires, Atlas Jack Plate, professionally winterized, less then 100 hours! Ready to fish!